All I can see from my kitchen windows is snow, snow, and more snow. The winters are very long here, and spring is still several months away… this is a time when I absolutely yearn to see something growing and GREEN, so I really enjoy the herbs that make up my little kitchen garden. The commercially sold herb growing kits are OK for starting the seeds, but I have found that they almost never have pots large enough to accommodate the herbs once they get past the tiny seedling stage. It’s less expensive, too, to just purchase packets of seeds, and since I keep the unused seed packets in the freezer, the leftover seeds remain viable for many years. I start my seeds in washed and sterilized styrofoam tubs, like the ones that ground beef or turkey is sold in, although any similar container will work equally well. I punch several holes in the bottom of the container for drainage and for watering, then I fill the container almost to the top with a good all-purpose potting soil and plant the seeds, spacing them a distance apart and covering them with about one-fourth inch of soil. I put the container in a larger tray of tepid water (the holes in the bottom of the container will allow the water to wick up through the soil) until the soil is thoroughly moistened. Then I let the container drain for a couple of hours before putting it in a large plastic bag that will create a greenhouse environment for the emerging seedlings. In my house, the top of the refrigerator is a good temperature for germinating seeds… they will germinate faster in warmer temperatures, but until the seedlings emerge, there is no need for light… however, check the container periodically to be sure that the soil is not too wet or too dry. If the soil feels too wet, open the bag… if it feels too dry, soak the container again. Usually nothing will need to be done until the seeds germinate. Once the seeds have germinated, I remove the plastic bag. Now the little seedlings will need light and a lot of it. If you have windows with a southern or western exposure and at least six hours of bright sunlight per day, you may not need any additional light. We rarely get that much sunlight here in the winter, so I supplement sunlight with LED grow light fixtures. I keep the lights a few inches above the seedlings and adjust the height as the seedlings grow. I transplant the seedlings to individual pots as soon as they have a second set of leaves. I have found that a four-inch diameter pot is a good size for most young herbs because there is enough soil available for root growth and the pot is large enough so it does not have to be watered as frequently. I prefer watering from the bottom… I just put several pots in a water-filled tray and leave them until the surface soil is damp to the touch. It is important not to over-water herbs… they do not like to have wet roots and should not be watered again until the surface of the soil is dry. Another thing I have found is that some of the seeds that are routinely included in the commercially sold herb kits do not do as well indoors. Sage, for example, will germinate and grow, but it really needs outside conditions and a much larger space than any inside container can give it. 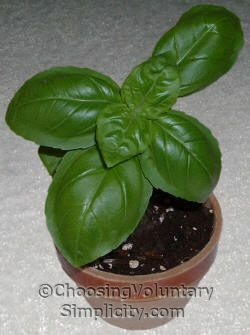 Oregano seedlings, started from seeds, can often have a very unpredictable flavor. This is one herb that is better to start from plants. Many other herbs, like mints, just do better outside… but there are many reliable candidates for indoor gardening that are very easy to grow, including my favorites… parsley, basil, chives, and thyme. These are wonderful tips. I’m excited to grow my own herbs this year and this post gives me the inspiration to actually get started. Thank you for such complete information. I’ll let you know how things go. I have bookmarked this post to come back to. I tried growing herbs from a kit last year but they didn’t do very well. After reading this post I think the tiny little pots in the kit might have a lot to do with my lack of success. This is great info, thanks. I use ProMix and I have those seed starting kits with the domes. And I use 4 foot grow lights that I purchased years ago. I just hope the tomatoes do better this year! I start mine from seed so I can be sure they are organic. Last year what with the unending rain and the blight I had to buy tomatoes for the first time in years. I don’t know about you, Shirley, but I love to curl up with a good seed catalogue on a cold winter’s day. I get lost in the variety and color that Nature has to offer. I have been ‘poking around’ on your website this past week. 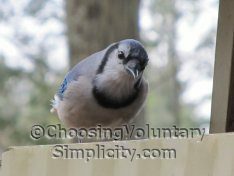 Reading your posts on simplicity, decluttering, and balance, I have enjoyed your view on all these subjects. Many years ago, I read “More With Less”, which is one of the ‘early’ simplicity books, written before simplicity became a popular media subject. My life has been one of simplicity for the most part. I agree that balance is most important, not the act of decluttering for the sake of purging. I am looking forward to reading more of your posts. Thanks Shirley – great tips! Now I feel inspired to get those seeds going! I have been growing my winter herb small gardren for many years. I’m not young and I can’t work in a garden/ but I’m happy with my window and balcony garden. Ran into your blog looking for assurance that I could make powdered sugar from granulated sugar. Looks and sounds like you are enjoying a wonderful life in a beautiful place. Your experiences and ideas are enjoyable and helpful. I’ll be back to read more.